A newer mantra for breweries has been “deeper, not wider” in terms of growth plans. Instead of sending beer farther away from their home base, many have opted to make their current territories a priority and work at getting more consumers to connect their brand. 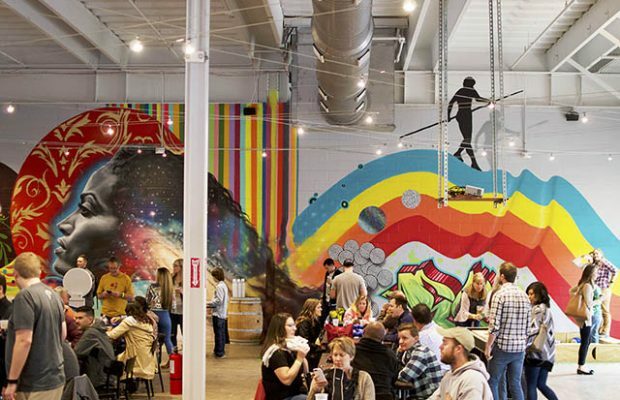 This past weekend, Asheville, North Carolina’s Hi-Wire Brewing (which has it’s production facility and two taprooms in the city) dug in to show they want to capture a segment of consumers in Durham — a city three hours east of home base. The brewery already has sales reps (which they call “Beer Jugglers”) in just about every market they distribute to. It’s able to show customers, retail accounts and wholesalers who they are as people and as a company. The 10,522-square-foot, 24-tap space includes one-offs, sours, guest wines and ciders. called Hi-Wire “a anchor tenant in a rather large development” in Durham. “Our financial partners understand its importance as well as our brand’s strong sales trajectory, and have been amenable to supporting us as we grow,” he noted. This is the first location that they brewery has opened outside of Asheville. Charnack said that they were able to take what had worked for them in Asheville — the layout, the feel/vibe, the neighborhood — and apply those lessons to the Durham location. Charnack said that Hi-Wire’s brand reflects their desire to have a laid-back, low-key, yet fun and entertaining space. “It’s also important to us that our spaces add to the neighborhood, so we strongly value repurposing older buildings, particularly in urban neighborhoods,” he explained. “So we honestly looked at our values and what we think both we and our consumers would want in a taproom and just did that.